Registration Open for 2019-2020 school year! 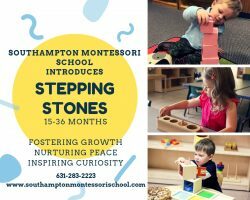 Southampton Montessori School is a private Toddler, Pre-school, Kindergarten, and Elementary for children ages 18 months-9 years old. It is an affiliate of the American Montessori Society and chartered by the New York State Department of Education. 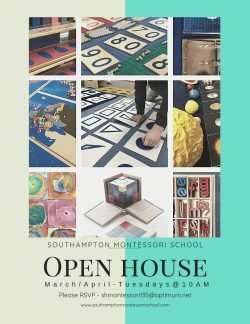 Southampton Montessori School was founded by Irene Hope Gazza in 1983. Irene Hope Gazza, Founder and Director retired in June of 2016, but plans to always remain a staunch supporter of the school. Southampton Montessori School provides a nurturing learning environment in which students interact respectfully within a peaceful school community. Enrollment throughout each three year cycle (Toddler, Primary, Lower Elementary) is encouraged so that students may learn at their own pace. A full spectrum of beautifully designed Montessori materials offer concrete hands-on experiences in each of the learning areas of the classroom; Practical Life, Sensorial, Math, Language, and Geography/Science. Students are guided through the sequences as they achieve understanding and mastery at each level. Independence and confidence builds and self-motivation is maintained. Upon completion of the three-year cycle all students are competent learners well prepared for the next cycle or level of learning. The young child has a strong desire to understand the order in the world and a unique ability to absorb new concepts.